LAKE FOREST, Ill. (AP) — It’s unusual to see Chicago unable to run the football. Then again, it’s not exactly common to see the Bears with an 8-3 record, either. Without being overly consumed by the thought, coach Matt Nagy expressed a desire Friday to get the dormant running game moving better than in Thursday’s 23-16 victory over the Detroit Lions or in other recent victories. “I don’t think too much is being made of it,” Nagy said. “You have to be able to run the football inevitably. You can’t be one-dimensional. It’s just like on defense. You’ve got to be able to stop the run. The Bears had 38 yards rushing in their win over the Lions, and have had 148 total yards on the ground in the past three games. Their 38 yards Thursday matched their lowest total in a victory since the second game of the 1970 season. Still, Nagy will continue looking to the best matchup — even if it means an attack completely based on the pass. There’s plenty of evidence to suggest it’s not the most important statistic, anyway. They ran for 134 yards or more in all three losses. They also ran for 122 yards or more in three of their wins. 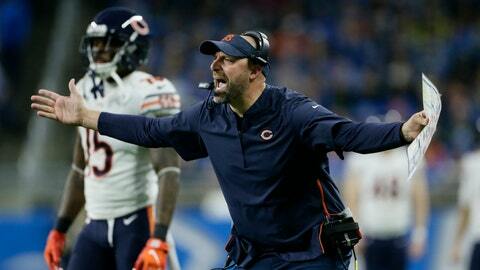 Bears fans’ angst about the running attack might not be a strategic concern, Nagy suggested. The Bears are doing that. They have won five straight and have a weekend off now while the rest of the NFL plays, then return Tuesday to get ready for a Dec. 2 road game against the New York Giants. Chicago was able to win on Thursday despite having the sluggish run game and playing backup quarterback Chase Daniel for injured Mitchell Trubisky. They might not know Trubisky’s availability for the Giants game due to his right shoulder injury until late next week. “He’s got to communicate to us how he feels and then we’ll do the same and figure out where it goes on a day-to-day basis,” Nagy said. Much like with the lack of a running game, the Bears say they’ll adjust if they have Daniel playing again against the Giants. Daniel completed 27 of 37 for 230 yards and two touchdowns. Nagy said Trubisky may have even learned something about the offense from watching the win over Detroit.